You can never have too many!! I guess you can never have too many shoes or handbags either – or metres of fabric!! 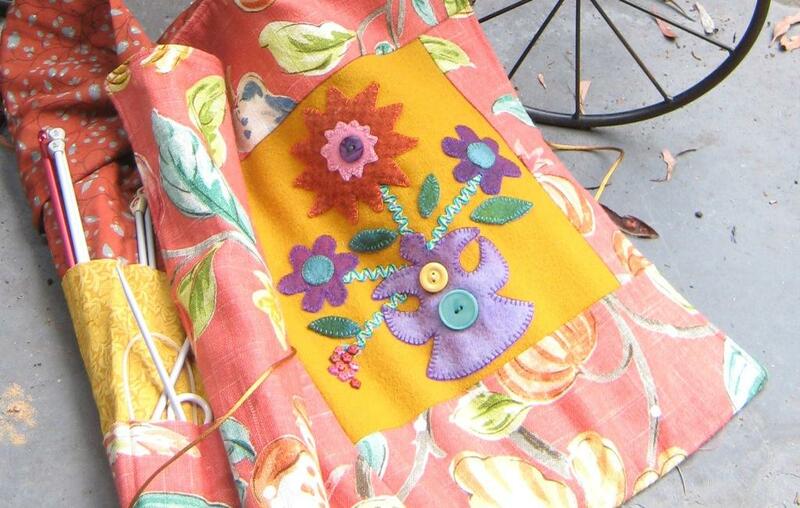 Over the years of involvement in patchwork, I have managed to acquire some beautiful pincushions. 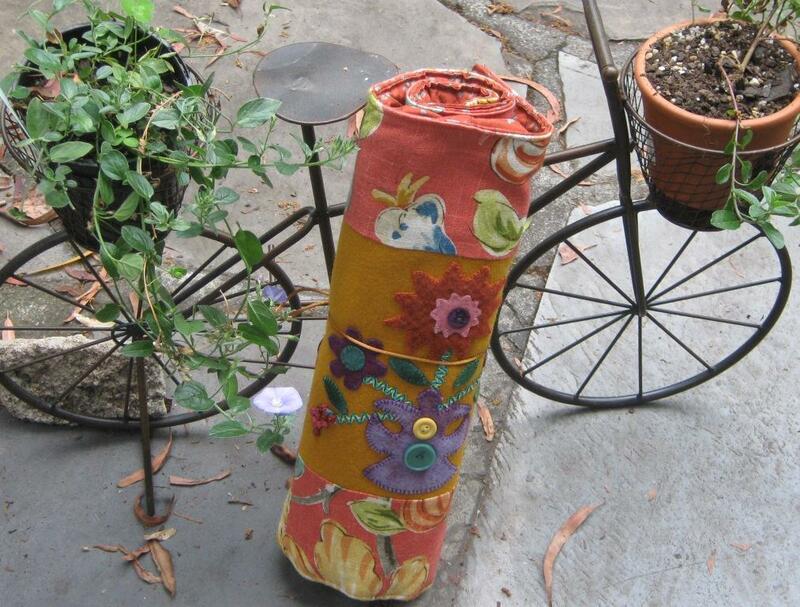 Some have been given to me at various quilting events and some I have made for myself because I just liked the pattern. My favourite pincushions are those made by friends for me. I look at them and remember who gave them to me – and they are just so special. I keep some pincushions in a basket, some in an old hat box and the rest are put in with various sewing projects. You can never have too many pincushions!! This month I designed and made myself a new one using some lovely felted wool from our shop and worked it with the Aurifil Lana. The pincushion is nearly finished! I am hoping the felted wool starts to ‘wear’ on the edges to make an interesting effect. 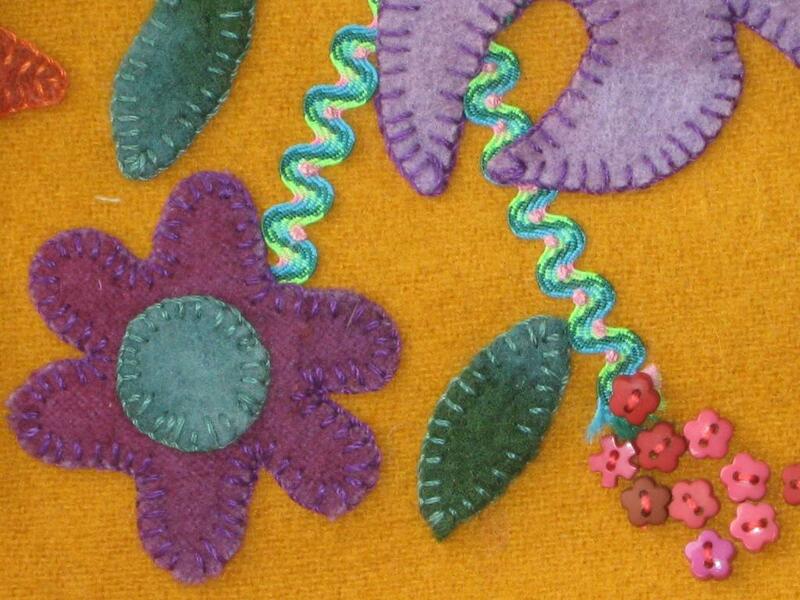 I buttonholed all the seams in a matching purple wool and did a running stitch on the petals and leaves. 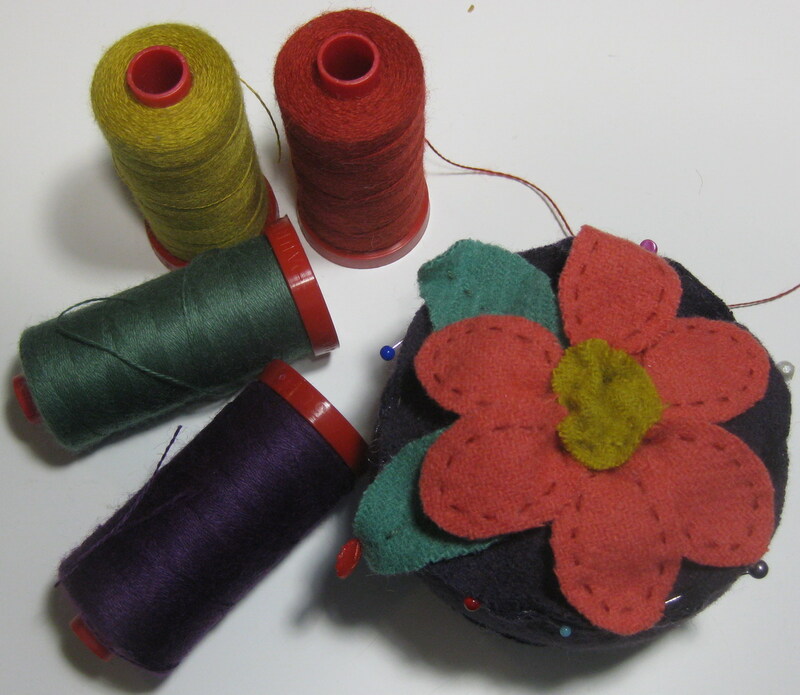 The Lana really works well with felted wool and there are just so many colours to choose from. 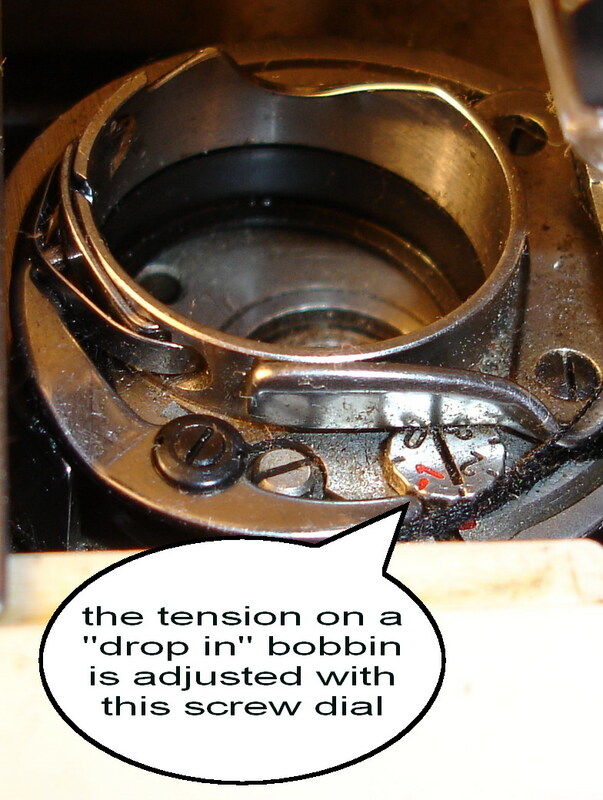 Last month I started writing about sewing machine maintenance so this month I thought I would continue the theme by talking about adjusting the thread tension. It is a timely topic as Lana Wool thread, our Calendar Girl thread for March, is great fun to play with in the sewing machine, but you do need to loosen the top tension for this thicker Ne 12 thread to get best results. 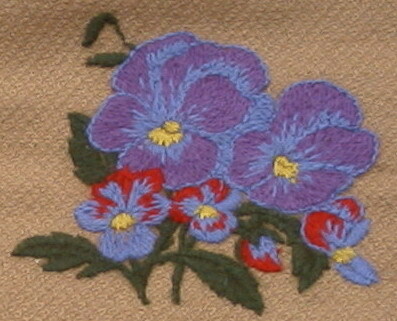 A Pfaff programmed embroidery design, stitched with Lana wool thread. Apart from the times when you might wish to play with unusual threads, having the ability to adjust the thread tension in both the needle and the bobbin will help keep your sewing machine in good working order. Good thread tension means that the machine can make a well balanced stitch with the top and bottom thread locking together in the centre of the stitch. If the stitches are forming properly it helps to prevent thread breaks which can cause small pieces of thread to catch in the bobbin race. People often tell me that they find the thought of adjusting the tension on their machine too scary to consider, but it doesn’t have to be something to fear. I did an internet search and found this great printable reference with drawings of good & poor stitch tension and simple clear instructions about tension adjustments. There are only two options for changing the thread tension, either the top thread or the bobbin thread, and it is generally easier to start by adjusting the tension on the thread which runs through the eye of the needle. 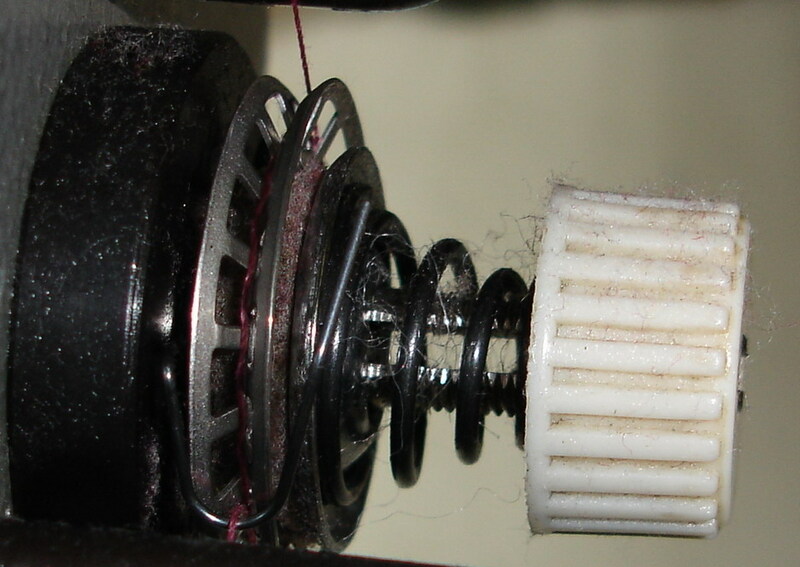 By tightening, or loosening, the tension on the top thread it is possible to allow the locking point between the top & bobbin thread to move back into a balanced position. 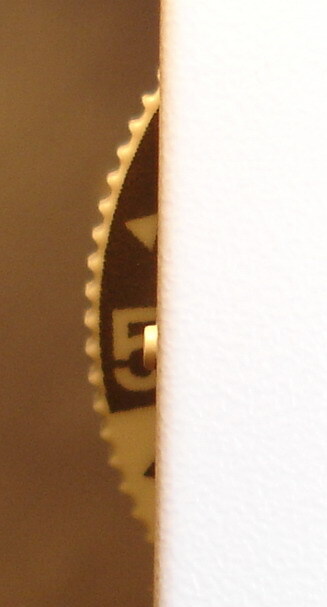 The tension dial for the top thread has two disks between which the thread travels, and the gap between the disks is controlled by a spring. 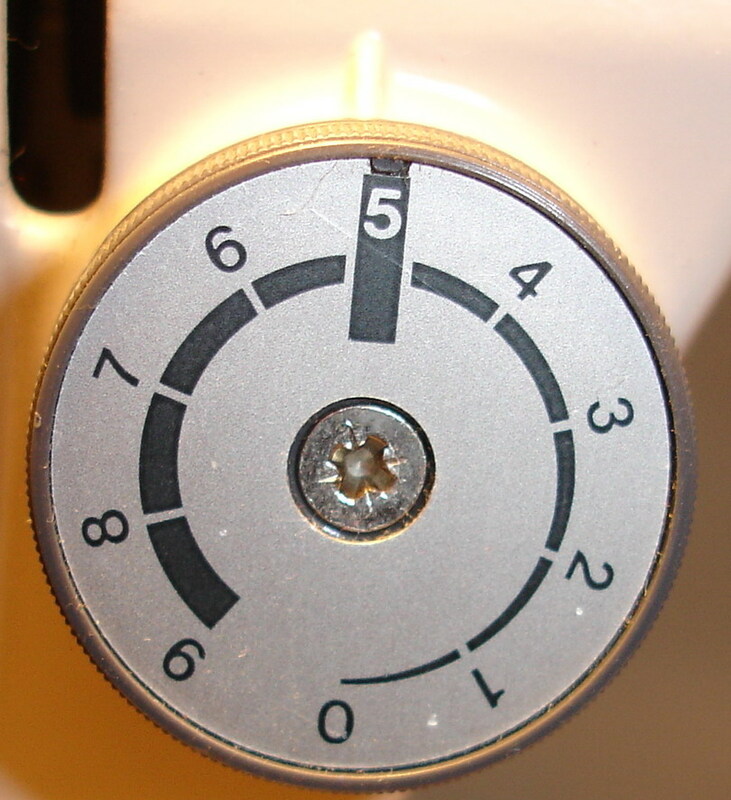 Usually the only part that is visible on a domestic sewing machine is the dial that controls the spring. As you move the dial, to open (loosen) or close (tighten) the tension on the thread, keep a record of the positions that work for different threads or types of stitches. On some machines the tension dial is hidden inside the machine case. Before you start making any changes clean & re-thread your machine and make a stitch sampler & record the current settings. Most machines will have numbers on the dial, but if the dial on your machine is blank use a permanent marker to add your own numbers or simply draw yourself a clock face record. A clearly marked top tension guide. 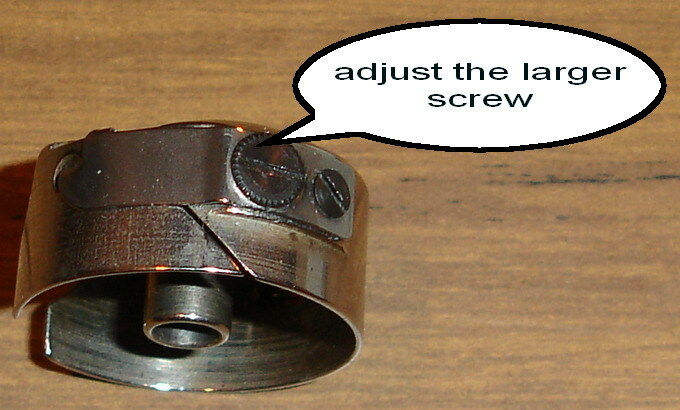 Rotate the dial to the right to tighten the thread tension or to the left to loosen the tension. Depending upon your sewing machine, the bobbin either goes directly into the bobbin race in the machine, or it is put into a separate bobbin case before that is inserted into the bobbin race. Most machine handbooks will have some clear photos to show you how to thread & set the bobbin into the machine. In both cases the tension on the thread is controlled by turning a small screw that will open (loosen) or close (tighten) a “spring” . HINT 1: “Righty Tighty, Left Loosey” is the adjusting meme/mantra that helps me remember which way to turn the top tension dial and bobbin set screw. HINT 2: If the machine tension is badly out of balance thread the bobbin & needle with two different thread colours, of the same thread type, so that it is easy to identify which thread is pulling tighter than the other. HINT 3: If your machine has a separate bobbin holder you can always purchase a second holder and keep it permanently adjusted for the slippery or fancy threads. Now it is time to have some fun machine stitching. Don’t forget to tell us about your latest project.